Pittsburgh's iconic fountain at the tip of Point State Park features prominently in city lore, including that of a final resting place for a long lost "fourth river." In reality, the fountain runs on treated city water. The Century Building on Seventh Avenue uses water from Pittsburgh's aquifer, sometimes incorrectly called "the fourth river," for heating and cooling. There are four wells at the Century Building: two draw water and two reinject water into the aquifer. An unsassuming piece of equipment, the heat exchanger makes it possible to transfer heat energy from the water to the building and vice versa. Glaciers were coming and going in the Northern Hemisphere about 2.5 million years ago. By about 798,000 B.C., they had advanced into Pennsylvania, moving through cycles of advance and retreat every 100,000 years or so. As they retreated, miles of ice melted and sent torrents of water cutting into the landscape, carrying huge amounts of sand and rock with them, Jones said. Downtown, the North Side, the South Side — all those long, flat areas on either side of the river that became the bedrock of industry, hearth and tradition — weren't divined by good planning, but built on sand. Some people have mistakenly dubbed this water supply “the fourth river,” as if you could rent a kayak and shoot through a hidden cavern. 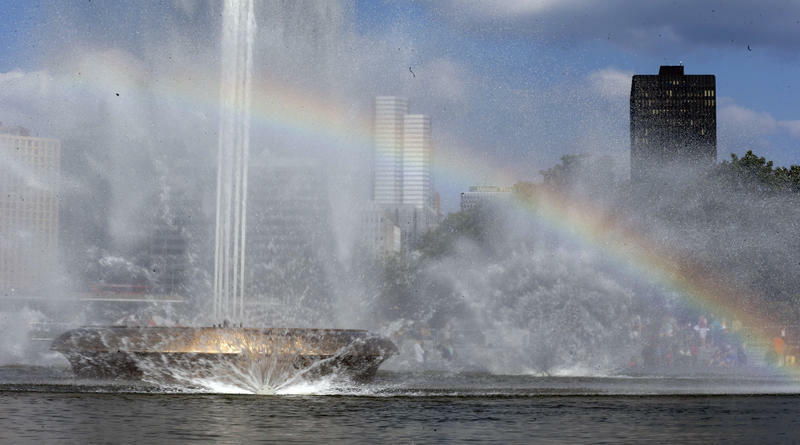 Legend has it that the Point State Park fountain draws from its estruary. That would be cool, but it’s not true. The fountain runs on treated city water and the fourth river is really just 50 feet of sand and gravel on top of rock. But that doesn’t mean groundwater isn’t miraculous. Bill Gatti, president of Trek Development Group, stood in the basement of the Century Building on Seventh Avenue last week. Carefully avoiding a puddle of standing water, Gatti pointed out the guts of the 108-year-old building’s open loop geothermal heating and cooling system. Groundwater, as far as heating and cooling goes, is like a loyal friend — reliable, steady, with a fairly constant temperature that’s about the average annual air temperature. In Pittsburgh, that’s between 50 and 54 degrees Fahrenheit, said Nina Baird, assistant professor at Carnegie Mellon University’s school of architecture. Instead of sucking in humid, 90-degree air and cooling it to a dry 72, the Century Building uses groundwater to take heat out of the system and deliver cool air. This might seem very modern and cutting edge, but Baird said water use is as basic as it gets. “We’ve used groundwater for years in the city — to do cooling, at least. Lots of times in our industrial past we might have been using that water for process cooling or there could be parts of a manufacturing process that need water,” she said. By 1950, there were 85 wells in the Golden Triangle that drew 9 million gallons of water every day. Imagine nine pools: each as long as a football field, 50 feet wide and 10 feet deep. Now imagine draining all of them, every day. While many of those wells have been capped, some buildings continue to draw on the aquifer,” Gatti said. Over the next 10 days, there’s almost no chance of meaningful precipitation in Phoenix. But if a test well were drilled in Downtown Pittsburgh tomorrow, 600 gallons a minute would gush to the surface.